All of our programs employ the award winning Community Action and Problem Solving Process. 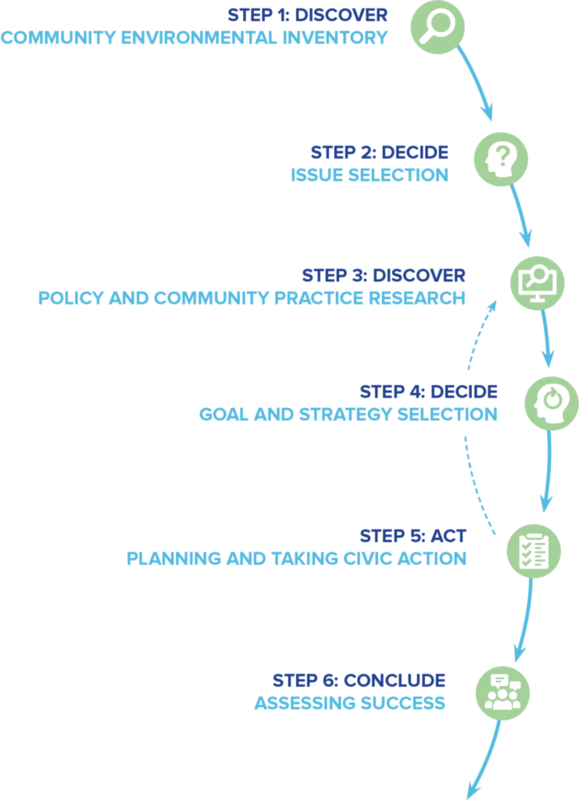 The Community Action and Problem Solving Process is a six-step model that combines civic engagement, environmental education, and STEM. Youth work with their educators to identify and research local environmental issues, resulting in a civic action project that addresses their selected issue. Earth Force provides professional development and support to local partners and educators in preparation for working with students. To learn more about becoming involved with Earth Force contact earthforce@earthforce.org. This Process Overview Graph represents the components of each step and their relationship to one another as a quick reference guide as you work through the Process with your students. Educators across the country use the Process to teach science, engineering, math, and humanities to their students. Earth Force and its partners prepare educators through a blended learning professional development program designed to train and support educators as they help students master science concepts by applying what they learn in the classroom to the problems they find in their communities. Local organizations play a key role in connecting educators to the community, creating hands-on learning experiences, and serving as experts in the local issues.